Melissa Sterry’s career is both unique and remarkable. Starting as a highly talented designer, she has become a board-level design scientist, recognised as a world leading authority regularly featured throughout the media. Melissa’s Futurology work on emergent digital technology and its applications is published in over 60 international trade, consumer and academic titles. Her groundbreaking e-book: ‘Biomimetics: Learning from Life’ sets the benchmark in its field. Most recently, Melissa has been listed as the only British female on the ’40 over 40 Women to Watch’ 2014 honoree list. 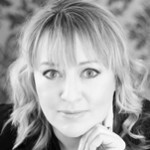 Melissa is much in demand as a keynote speaker, panellist, panel chair and/or workshop host. To date she has appeared at more than fifty leading international conferences, seminars and other events throughout the world, including UK, USA, Europe and Russia. Her subjects are wide ranging. She is equally at home speaking on biomimetics – the imitation of the models, systems, and elements of nature to help solve complex humanity problems – as discussing ‘the future of confectionary’ or even ‘the future of telecommunications’. Along with keynote projects, Melissa is a popular media figurehead. She was Technology Figurehead for The Guardian’s ‘The Future Designed Around You’ supplement (sponsored by Volvo). She was also Futurism Figurehead / consultant for the Sleep Council’s ‘ future bedroom’ project, which looked at how new science and interior technology product design impacts the bedroom. Since January 2010 Melissa has been developing the Bionic City®; a cutting-edge project that emerged as a spin-off project from Melissa’s PhD research. Focusing on developing city-scale resilience to major natural hazard events, Bionic City® explores how nature would design a city. It examines complex adaptive systems that mimic the behaviours, relationships and systems of flora and fauna species. Extending beyond Future Cities, Melissa’s knowledge covers issues critical to the future built environment. • PhD Researcher at the Advanced Virtual and Technological Architecture Research (AVATAR) group at the University of Greenwich. • Postgraduate Certificate with Commendation in Innovation and Enterprise from Kingston University London. • Bachelor of Arts with Honours and Commendation for her final year thesis in Design Practice from the University of Salford. Melissa is also a visiting Fellow and guest commentator at several leading European architecture and design research institutes, including Ravensbourne, University of Salford, Institute for Advanced Architecture of Catalonia, The Bartlett and the Architectural Association School of Architecture.